With World War I commemorations taking place last weekend, so we thought it fitting to take a look at one of the city’s memorials. 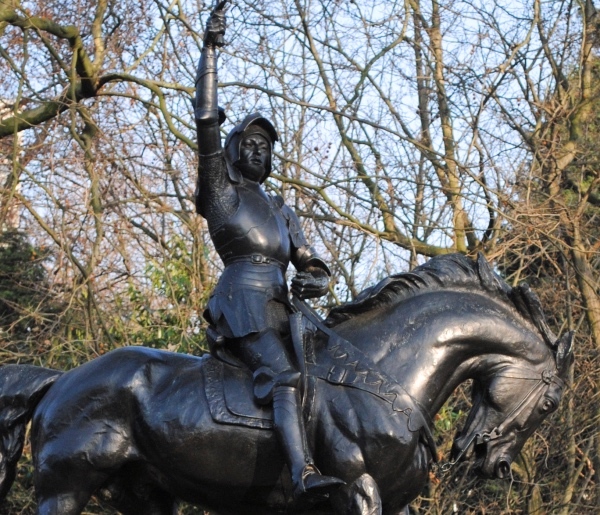 Located in Hyde Park, the Cavalry Memorial (also known as the Cavalry of the Empire Memorial), which commemorates the more than 4,000 members of the cavalry regiments killed during the “Great War”, depicts St George (patron saint of cavalry), shown as a knight, triumphing over the defeated dragon coiled beneath his horse’s hooves. It’s said that St George was modelled on 1454 bronze effigy of Richard de Beauchamp, 13th Earl of Warwick, and that the horse was adapted from a 15th century engraving by Albrecht Dürer. 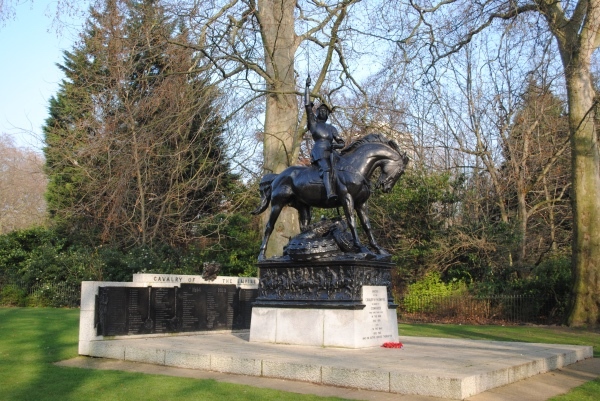 The pedestal underneath is decorated with a frieze of galloping horsemen from different countries within the Empire and the statue is accompanied by a stone backdrop, originally designed to shield the statue from Park Lane, upon which are bronze plates listing cavalry units from across the British Empire that served in World War I along with the names of the four cavalry officers who became field marshals – Haig, French, Allenby and Robertson. Designed by army vet Captain Adrian Jones, the bronze sculpture was made from guns captured during the war (Jones also sculpted the Quadriga atop Wellington Arch on Hyde Park Corner). The Portland stone pedestal was designed by Sir John Burnet. The Grade II*-listed memorial, which was proposed in 1920, was originally unveiled by Field Marshal John French, 1st Earl of Ypres and the Prince of Wales (later Edward VIII) on 21st May, 1924. It was originally located at Stanhope Gate but was moved to its present site to the west, near the bandstand, in 1961 after Park Lane was widened. For more on Hyde Park, see www.royalparks.org.uk/parks/hyde-park. For more World War I memorials in London, see our previous special series here.